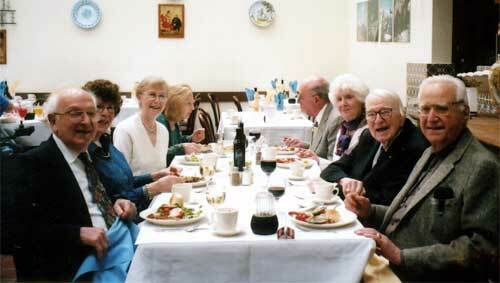 On Sunday 24 April, eight old, and I mean very old (all pre-1950), Aramcons had lunch at a Spanish restaurant in San Francisco. Afterward the group spent the afternoon reminiscing at the home of one couple, Dawn and Cliff Flittie, who live in St. Francis Wood. Their house has a fine view of the Farallon islands near the entrance to the harbor of San Francisco. The get-together is an annual event. This is probably the eighth reunion of the group that originally totaled fifteen. George Blakslee, a charter member, lives too far away (Wisconsin) to have attended the last three meetings. Read more about the "Old Timers". Sandy also wrote the book Ibn Saud: King by Conquest.